Japanese Climbing Fern (Lygodium japonicum) and Old World Climbing Ferns (Lygodium microphyllum): are presently the only non-native invasive ferns in Florida. Both ferns reproduce and spread readily by wind-blown spores. A single fertile leaflet can produce 28,600 spores. Animals, equipment, and even people that move through an area with climbing ferns are very likely to pick up spores and move them to other locations on the property or even to other properties. In 2005, they covered 122,787 acres of Florida. 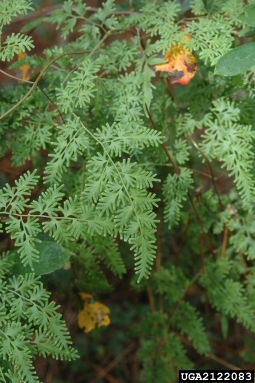 Japanese climbing fern is a delicate looking perennial climbing vine. It is capable of forming a dense mat-like thatch capable of covering trees and shrubs. Initially, it was introduced from Japan as an ornamental. It is scattered throughout the lower portions of Alabama, Georgia, Louisiana, South Carolina, and south into central Florida. Further planting or cultivation of this vine is prohibited by the Florida Department of Agriculture and Consumer Services. It climbs very quickly to the crowns of pine trees, which can move fire into the growth points during controlled burns, making it a concern on forested lands. was found in natural areas of Marion County. The northern edge of its advance by 2012 was Hernando County on the Gulf side and Duval County on the Atlantic coast. Japanese climbing fern. However, when the plant is growing in areas adjacent to wetlands or water, fewer herbicides are registered for those sites. Hand digging is also an option, except when the fern is producing spore covered leaflets. Disturbing it then would propagate more plants. 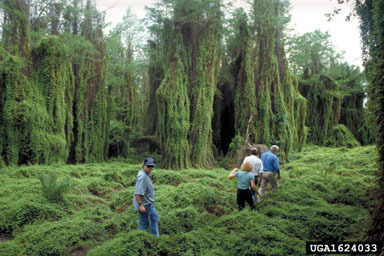 As with most invasive plants, repeated and correctly timed treatments are likely to be necessary. For more information about climbing ferns contact your local UF/IFAS Extension Office and read the following publications: http://edis.ifas.ufl.edu/fr133 and http://edis.ifas.ufl.edu/ss-agr-21. For more information contact Les Harrison, Agriculture & Natural Resources Extension Agent by phone at 850-926-3931. Chinese Privet (Ligustrum sinense): Chinese Privet is a non-native shrubby tree commonly found in forested areas in northern Florida. This eastern invader thrives in low-lying, wet areas near forest openings and fence rows. Other species of the Ligustrum genus are commonly grown in landscapes. 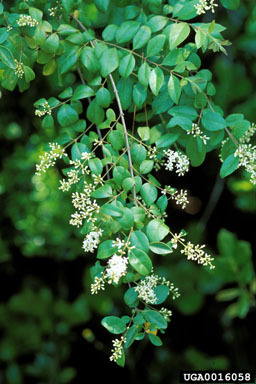 Chinese Privet can be identified in the spring by its small white flowers which omit a foul odor. Birds easily spread this weed by feeding on and excreting the fruit which contain many seeds. Additionally, Chinese Privet can spread by underground plant structures called rhizomes which allow new shoots to sprout up from the ground from a mother plant. For control options of Chinese Privet, see https://edis.ifas.ufl.edu/pdffiles/FR/FR25000.pdf or contact your local Extension agent. For more information, contact the author Josh Thompson, Regional Agriculture/IPM Extension Agent 850-482-9620.